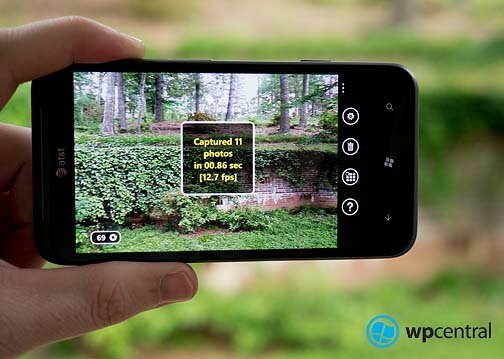 Here's a neat camera app for your Windows Phone. Turbo Camera brings a burst mode of sorts to your Windows Phone camera by taking pictures in the neighborhood of 14-16 frames per second. The app also has a timer feature and a delay for those times you don't need the high speed shutter. Turbo Camera has room for improvement but as is, it's a decent camera app for your Windows Phone. 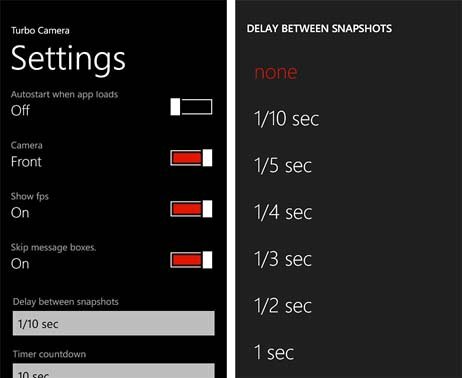 The app itself is your typical Windows Phone camera viewfinder with button controls along the right edge of the screen and a picture counter at the bottom left corner. Button controls provides access to Turbo Camera's settings, a dump for the photos taken, a button to view the photos taken, and a help button. Just line your shot up in the view finder and hit the shutter button. The number of shots is only limited by your memory buffer. As you capture the images, the counter in the left corner will keep track of how many frames have been captured. When you are ready to review your pictures, hit the "view" button (third from the top). The nice thing about Turbo Camera is that you only save the images you want, everything else will be deleted when you exit the app or hit the delete button. Turbo Camera also supports the front camera and if you want to slow things down, there is a delay setting. Turbo Camera is a neat camera app but there are a few downsides. First, the app captures images at the lowest resolution. Images are captured at 640x480. The low resolution helps speeds things up but restricts your image quality. According to the developer, the next update will offer resolution settings. It may slow things down a bit but image quality will improve. Next, to switch between the front and rear cameras you have to go into the settings. It would be nice to have an extra button on the main view to switch between the cameras. Lastly, Turbo Camera doesn't default to a fast enough shutter speed to freeze or stop action. My guess it defaults to the in-house exposure controls for the Windows Phone camera. The result is a good bit of motion blur in your photos. The best way to reduce the motion blur is to shoot in bright light so the camera will automatically use a faster shutter speed for proper exposure. You still get a little blur but not as much as you would in shooting in lower lighting situations. Performance wise, I was able to shoot as fast as 14.5 fps with the Nokia Lumia 900 and 15 fps with the HTC Titan II. I'm able to capture about 50 frames on either Windows Phone before the buffer fills. All in all, Turbo Camera is an interesting camera app for your Windows Phone. I'm not sure if Turbo Camera's objective exceeds the Windows Phone cameras' potential. If you can find a way to increase the resolution, utilize a faster shutter speed while maintaining proper exposure, and maintain a high frames per second then I can see the app really shining. As is, Turbo Camera has some nice features and under the right conditions can come in handy. I don't think it will let you capture Sports Illustrated action photos from your kids Little League games but it may help you chase your kids around the yard or that camera shy person who always turns her head at the last second. There is free trial version available for Turbo Camera to let you try it before you buy it. The full version will run you $.99 and you can grab it all here at the Windows Phone Marketplace.